The gender pay gap has widened in favour of men at nearly half of the UK’s largest companies and public sector bodies over the past year, according to analysis of new government figures. Almost eight in 10 companies still pay men more than women with more than a quarter paying female employees up to 20 per cent less. Overall there was no significant improvement in the gender pay gap since the previous year with the gap shrinking slightly from 9.7 per cent to 9.6 per cent. 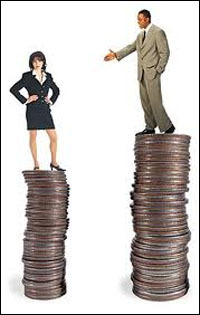 All organisations with more than 250 employees have to publish their gender pay gap figures. The deadline for the public sector was 31 March, while charities and companies had until midnight on 4 April to file. Of the 10,444 companies that had filed by the deadline, 8,124 (78 per cent) paid male employees more than female staff based on median hourly pay. Just 1,425 (15 per cent) paid female employees more than male staff. And 900 companies (9 per cent) reported no difference in pay between male and female employees. Almost 3,000 companies (27 per cent) paid women over 20 per cent less than men based on median hourly pay. Just 118 companies (1.1 per cent) paid women over 20 per cent more than men. And the gender pay gap has widened in favour of men in nearly half of companies over the past year, according to analysis by the BBC. Of the firms that had filed comparison data before the deadline, 45 per cent reported wider pay gaps in favour of men than last year. Nearly a quarter favoured women and the rest reported no difference, according to the BBC. The good news is that the median pay gap has lowered slightly this year but even then it is only a small decrease. It may be the case that the average gap has got worse because employers have recruited more women at an entry level so that they can progress through the organisation but we do not know as employers do not have to provide a narrative for the figures. Just reporting on the figures is not enough – to tackle the gap, employers need to analyse the data and put in place an action plan to address the pay gap. There is no quick fix to this issue but without organisations being transparent and Boards being held accountable for action plans, employees, consumers and stakeholders will not have confidence in employers that they are doing enough to close this gap. These figures show the harsh reality that there is no quick fix to pay parity when there are often complex factors that have led to an organisation’s current situation. A common thread running through many company commentaries is that their efforts to bring balance across their organisation have started in junior recruitment. That strategy is just too long-term when the UK government is expecting meaningful change within five years. What’s more, that issue will become even more pronounced next year, when legislation around executive pay ratio reporting comes into force. Organisations need to act quickly to ensure they can produce and calculate metrics and intelligently, so they have time to reflect on what it means for their staff and their talent development strategies. The new data has revealed, again, that organisations continue to fail to eradicate the gender pay gap. Of course there are many organisation who do work hard to remove the barriers, however I believe that the current issue is the ‘just reporting’ culture, the issue is that they are approaching the gender pay gap from a legislative perspective. Reporting the data shouldn’t be used as a marketing tool, but as a source of assessing whether the strategy to eradicate the gap is effective or not. Stagnation is a feature with this new data. Interested in diversity in the workplace? we recommend the Diversity and Inclusion Conference 2019, and Diversity and Inclusion for HR Professionals training day. We also recommend you join our free live webinar, Gender Pay Gap: Where Are We Now, om April 30th. Register for free here . Does your company pay men more than women? Yes it does, but not BECAUSE they are men or women. We pay people in high-pay occupations more than we pay those in low-pay occupations. We pay Sue, Sales and Marketing Manager, more than Jim who drives a fork lift in the warehouse. We also pay Freda and Cyril exactly the same salary (as they do the same job), but because Freda pays her pension fund contributions by salary sacrifice, her ‘GPG pay’ is artificially lowered. Is anyone able to explain to me what meaningful conclusions may be drawn from GPG data ? – because I have yet to find any. No comments appear on this story – but when I tried to submit one a moment ago, I received an automated comment that I have already commented. Possibly there is a glitch in your system ?